The Midwest League came down hard. Jimmy Roso and three other players were suspended, a fifth let go outright by his team. Their crime? Apparently trying to cause a rainout. "Somewhere down the line, two or three years down the road, we'll probably smile a bit," Midwest League President George Spelius told The Los Angeles Times. "But now the smile comes harder when you think of what could have happened." In something compared to a scene from the movie Bull Durham, Roso and the four other members of the Wausau Timbers were accused of climbing into South Bend's Coveleski Stadium overnight and pulling the tarp off during a rain storm. A double header had already been scheduled for that next day, but groundskeepers got the field ready and the games went ahead. The suspension concluded the second year in professional baseball for Roso. He was taken by the Orioles in the 21st round of the 1989 draft out of Linn-Benton Community College in Oregon. His career wound end after his fifth year, getting no higher than AA. Roso began at rookie-league Bluefield. In 48 games, Roso hit .307 and four home runs. He got the promotion to single-A Wausau in 1990. Despite the suspension-shortened season, Roso got into 97 games. But he only hit .242. Roso returned to the Midwest League in 1991, moving with the Orioles franchise to Kane County. In 58 games, he hit .307. But Roso was fortunate to return. One of his fellow Wausau Five, pitcher John Boothby, was released and never played again. 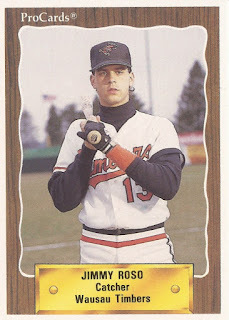 Roso hit high-A Frederick for 1992, but his average was dropping. In 66 games, he hit .220. But he made AA Bowie for 1993. In a June game, Roso hit the game-winning single, with two outs in the ninth inning, according to The Baltimore Sun. But Roso was released by year's end. The release not only ended Roso's career, it also ended a band before it could start. Roso, teammates Gregg Zaun and T.R. Lewis, had tried to make a band, according to The Sun. But those hopes ended with Roso's release.